Celebrating Canada as a world leader. Indeed, today Canada leads the G-7 countries — the U.S., UK, Germany, France, Italy and Japan — in economic growth, and has the distinction of being voted the “#1 Best Country for Business” by Forbes Magazine (2011) among 134 countries. Certainly, the most important provision from the point of view of tax and financial advisors and their clients is the age eligibility for OAS. This is a “heads up” change for the 45- to 54-year-old crowd and one that is hugely unpopular, judging from the 77% of Knowledge Bureau Report poll respondents who were against the move. However, if we are to understand the full effects of the changes, there are substantive details to explore, including one provision that starts soon. Effective July 1, 2013, Canadians will be able to participate in a voluntary deferral of the OAS pension for up to five years in order to receive a higher annual pension later. Healthy seniors, therefore, may be able to supplement the returns on their investments by postponing the OAS. It speaks to the need for a highly skilled retirement income planner well versed in tax efficiencies. The phase-in of the age eligibility of 67 is a good decade away and this allows for a savings period in which to fill the gaps left by the OAS. However, today’s budget forecasts continued low interest rates and increasing inflation for at least half that period. Achieving the shortfall may be difficult, given the investment climate predicted by private sector economists in the budget. (a) The highest-income earners will not be affected at all. If your income is more than $69,562 in 2012, for example, your OAS is already being clawed back. (b) Clearly low-income pensioners will suffer the most; for this constituency, an alternative to the OAS and Guaranteed Income Supplement (GIS) will need to be developed. Like the OAS, the eligibility age for the Allowance and the Allowance for the Survivor will also gradually increase, from 60 today to 62 starting in April 2023. (c) Middle-income earners — those with incomes today that fall under the claw-back threshold of $69,562 — will need to plan now. They may plan to work longer before retiring. If they work until 67, this will give them two additional years to compound savings and earn pension credits. However, if they decide to retire at age 65 or before, they will need to withdraw more money from private savings. Those withdrawals will come at the beginning of the retirement period, which has a big impact on capital accumulations for the entire period. If your plan is to live off the return earned on the capital and protect the $500,000 for your heirs, the loss of $6,500 in the first two years of retirement will result in a depletion of capital of about $26,5001 – you’ll only have $473,500 at the end of the 20 years instead of the planned $500,000. Alternatively, if you were not withdrawing but rather saving your $6,500 OAS receipts each year in the two-year period and the money was invested at 3% return for 20 years, you would be giving up after-tax growth (taxes at 22%) of $23,767. For a couple, that amounts to $47,534. This is not small change. The run-up time is also going to be plagued by low interest rates. So, just how much you need to save depends on how much time you have to do so, and the rate of return. The young have it easier: to recover the full $13,000 over a 20-year period and assuming a constant rate of return, compounding and no adjustment for inflation, the chart below speaks for itself. A Tax-Free Savings Account (TSFA) is the logical place to turn. Astute investors will be developing a completely tax-free pension plan for themselves, propelling their wealth much further than the heavily taxed generations of the 1990s, for example. How much can a TFSA help? This depends on the rate of return in the TFSA. • The nominal rate is 5.5% a year. c) The 40-year-old will need to save an extra $416 a year (or $35 a month) for 25 years (based on a nominal yield of 5.5%). The additional savings will drop as the current age of the future retiree drops. For example, a person who is 20 today will need to save an extra $189 a year to replace the lost OAS of $18,227 a year for two years starting 45 years from today. Interest rates will remain relatively low over the next five years: three-month Treasury bills are expected to pay 0.9% in 2012, 1.3% in 2013 and an average of only 2.3% a year in the period 2014-16. Ten-year government bond will pay only 2.2% in 2012, 2.8% in 2013 and 3.5% on average in that same period. Inflation, however will exceed those returns in the near future: consumer price index inflation is expected to be 2.1% in 2012 and 2% in 2013, averaging 2% for the period. GDP inflation is higher: 2.4% in 2012 and 2.0% in 2013 leveling off to 2.1% for the period 2014-16. In other words, real returns, for investors will be nil. The growth in the Canadian economy will fall behind that of the U.S.: for the period ending 2016; Canada’s average growth is expected to be 2.3%; for the U.S., the number is 2.6%. 1 Calculation based on return rates of 1% in the first year, 2.5% in the second, 3.5% in the third year and 4% in subsequent years. The original plan for $14,518 withdrawal in the first year increased by 2.7% annually. The original plan results in maintenance of $500,000 investment. By removing $6,500 extra in the first two years to cover missing OAS payments results in a reduction in ending capital to $473,300. It’s Your Money. Your Life. There many decisions to be made about your retirement savings, no matter what your age, as a result of this historic budget. Looking for rates of return that exceed taxation, fees and inflation will become a more important issue for Canadians as they save for retirement and attempt to accumulate, grow, preserve and transition purchasing power into the future. With every federal budget, we anticipate the continued reform of personal and corporate tax systems. The March 29 budget is no different. If the age of eligibility for Old Age Security (OAS) is pushed back, Thursday’s budget could be both historically significant and hugely unpopular (or so indicates Knowledge Bureau’s polling). You will do well to pay close attention to this budget and project the effects it will have onto your retirement and estate planning. In the aftermath of the global financial crisis, governments are forced to reign in spending and reduce deficits. So, you should be prepared for possible tax increases — such as social benefit clawbacks, increased user fees or changes to our taxing framework, which is based on another significant tax reform introduced in 1969. Canada’s then-minister of finance, the Hon. E. J. Benson, not only proposed increases to personal and corporate taxes but also, most significantly, brought capital gains into taxable income. His reasons were interesting in the context of today’s choices. Over time, inclusion of net capital gains in taxpayers’ income has added extensively to government coffers. In the first year — the reforms took effect Jan. 1, 1972 — it was estimated that single provision generated net government revenue of $60 million; by its fifth year of existence, it produced $245 million. Those were large sums for the times. But Benson did something else: he recognized the punitive effect of including in income “irregular” sources of income that would push taxpayers into a higher tax bracket and cause taxes to be paid at a higher tax rate that year than in a normal year. The “General Income-Averaging Option” — which averaged out income and taxes payable over five years — was introduced to help taxpayers avoid tax-rate spikes. Unfortunately, that provision was abolished years ago. Benson’s reforms were effective in their mission. They redistributed the income-tax burden and increased government revenue from personal and corporate taxes. The burden, however, landed squarely on the large, baby-boomer taxpayer base that was just graduating from university and beginning its work life. Yet, despite high tax rates on both income and capital, boomers were incented to work in this country, rather than leave for more competitive tax jurisdictions. Most attempted to save for retirement, despite high taxation in the 1990s (which was needed to reduce previous governments’ deficits and debt) and the debilitating effects of the recent global crisis. Retiring boomers now need to count on what’s left of their private savings, the Canada Pension Plan and the OAS to make it in a very different world. Unfortunately, heavily indebted federal and provincial governments once again face great needs to do important things. The federal government will have to make significant choices come Thursday’s budget. So may you, too. In fact, engaging with well-informed tax and financial advisors to mitigate any losses with sound tax and financial planning is a good first line of defense. It’s Your Money. Your Life. The degree to which the March 29, 2012, federal budget changes your tax burden will be of special interest. To find out what it means to you and your savings, please join the Knowledge Bureau Report team at http://www.knowledgebureau.com/ for our Special Budget Report. We’ll be there to help you decipher Budget 2012. 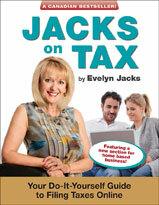 Evelyn Jacks, president of Knowledge Bureau, is author of Essential Tax Facts 2012 and co-author of Financial Recovery in a Fragile World. To purchase your books, visit www.knowledgebureau.com/Books.asp. Once all the members of your family — including minors and young adults — have filed their tax returns, you can turn your attention to teaching the next generation the long-term benefits of investing their returning social benefits and refunds wisely. Contributing up to $5,000 to a Tax-Free Savings Account (TFSA) each and every year is one way young adults can build a tax-free pension for retirement. Investment income earned in a TFSA accumulates tax-free, which means that future withdrawals from the TFSA are not taxed. This is extremely powerful. Imagine, future generations not needing to pay taxes on their retirement savings! But to make this a reality, your young adults must make maximum TFSA contributions part of disciplined annual savings program. Contributing to a RRSP is also very important and may, in fact, come before a TFSA in order of investing if your adult children have net or taxable income and sufficient contribution room. An RRSP deduction reduces net income, which increases refundable tax credits (such as the GST/HST credit) and enables the transfer of tuition, education and textbook amounts. Putting money into an RRSP early not only helps your young adults reduce taxes but will also create a three-part savings plan — for home ownership, life-long learning and retirement — all within the same vehicle. If you wish to add to your child’s nest egg, you can generally loan funds for investment purposes to your adult child without invoking the Attribution Rules in Section 74.1 of the Income Tax Act, which attribute resulting interest and dividends back to the lender. But beware of Section 56 (4.1) of the Act, which can attribute income back to the lender if it is reasonable to assume that the lender made the loan, or the recipient incurred the indebtedness, to reduce or avoid taxes. The Section 56 (4.1) rules are broader than the Section 74.1 rules and relate to all income earned on transferred property. It’s important to stay clear of the tax auditor. So, be sure to structure your affairs properly. It’s Your Money. Your Life. By filing audit-proof tax returns for all family members at the same time, starting with the lowest-income earner and moving to the highest, you can increase after-tax results for the family as a unit. Then, leverage any tax windfalls by teaching young adults the proper order for investing, so that they can maximize their opportunities to build tax-efficient, million-dollar futures with their tax-sheltered accounts. Evelyn Jacks, president of Knowledge Bureau, is author of Essential Tax Facts 2012 and co-author of Financial Recovery in a Fragile World. Knowledge Bureau also publishes The One Financial Habit That Could Change Your Life by Robert Ironside and Edwin Au Yeung and The Smart, Savvy Young Consumer by Pat Foran, both good guides for young investors. To purchase your books, visit www.knowledgebureau.com/Books.asp. If you are supporting an adult who is dependent on you because of mental or physical impairment, the Canada Revenue Agency (CRA) offers tax relief on this year’s federal tax return in the form of several, important, non-refundable tax credits. • Amount for an Infirm Dependant Over 18. (Line 306) If an adult is dependent on you because of an impairment in mental or physical functions, you may be eligible to claim this amount. The dependent adult’s net income — including social assistance and world income — in 2011 must be less than $10,358. • Caregiver Amount. If the dependant lives with you in your home, you may also be able to claim the Caregiver Amount. The dependant’s net income threshold is higher in this instance than the infirm-dependant amount. The tax credit begins to be clawed back around the $14,600 mark, making this credit accessible to more taxpayers, particularly seniors who are receiving public and private pension benefits. • Disability Amount. If that adult child is markedly restricted in daily living activities and a medical practitioner completes form T2201 Disability Tax Credit Certificate, you can also claim the Disability Amount — provided the disability is expected to last for a continuous period of 12 months or more. This amount is not income-tested; if the dependant does not have enough taxable income to absorb it, you — as the supporting individual — may claim it. • Medical expenses. Medical expenses for the dependent adult, too, may be claimed. Note that as of 2011, there is no longer a $10,000 ceiling on the amount of these expenses. • Child-care costs. Working parents note: you are also eligible for a lucrative tax deduction for infirm adult children who qualify for the Disability Amount. If you incur child-care costs at your expense, you may be able to claim those child-care expenses, up to a maximum of $10,000 a year. It’s Your Money. Your Life. If you are supporting an infirm adult, claim your tax credit. Or, if you know of a family that is taking care of an infirm adult, pass along this information. Often, these tax preferences assist greatly, especially if the caregiver’s ability to earn is curtailed because of the responsibilities of care. In fact, knowing about these tax opportunities can create important new money for investments such as a Tax-Free Savings Account or RRSP, which can bring further tax-advantaged cash flow into the family. Over time, taxes erode both your income and capital more than any other factor, making tax literacy an important part of financial literacy. So, it makes sense that those who have the most to gain by being tax-astute are the young; they have more time to benefit from the positive effects of investment compounding. File tax returns for adult children. Young adults — those who have reached the age of 18 in the tax year — should file a return regardless of income. Filing a return creates eligibility for refundable tax credits such as the GST/HST credit, available to taxpayers 19 years of age or older, or the Working Income Tax Benefit. (The latter, however, is not available to individuals whose annual income is less than $3,000 or who are students for more than 13 weeks a year, unless the student has an eligible dependent). Filing also gives young adults access to a variety of provincial tax credits. Because young adults often have more than one part-time job, employers may withdraw more income taxes from their earnings than necessary. Likewise, if young adults contribute to the Canada Pension Plan before the age of 18 or if their total income is less than the $3,500 basic exemption, they may over contribute to CPP. Similarly, they may pay too much to Employment Insurance. By filing a return, these young adults not only recover overpaid source deductions — and get a refund — but they also create RRSP contribution room based on their earned income, even if they are not taxable. Then, there are lucrative non-refundable tax credits, including the tuition, education and textbook amounts. If your young adult is a student at a qualifying educational institute, claiming these amounts on a return can reduce his or her taxes to zero. And, if unabsorbed on the student’s return, these provisions can either be carried forward for use in reducing future income taxes, or up to $5,000 can be transferred to a supporting individual, in this case, you. Your adult children, if 19 years of age or older at the end of the tax year, should also claim Public Transit Amounts for money paid for public transit passes. It’s Your Money. Your Life. Help your children become more tax-astute. Also, introduce them to your tax advisor. They will benefit from having a professional answer their tax questions. Today’s efforts will pay off handsomely in the future. Evelyn Jacks, president of Knowledge Bureau, is author of Essential Tax Facts 2012 and co-author of Financial Recovery in a Fragile World. To purchase your books, visit www.knowledgebureau.com/Books.asp . Knowledge Bureau also publishes The Smart, Savvy Young Consumer for young adults. To encourage tax literacy among your young adult children, order here.